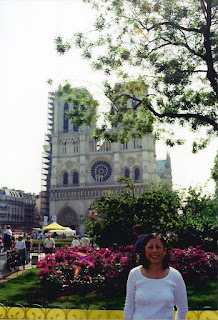 Catherine in front of the Notre Dame de Paris. 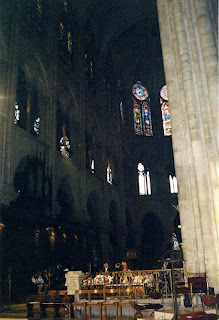 While Catherine and I were in Paris we attended service at Notre Dame de Paris (Our Lady of Paris) on Sunday. 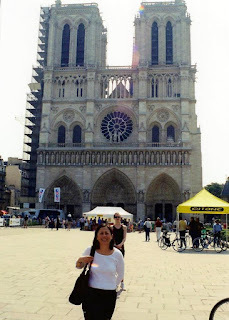 Notre Dame is a Gothic, Roman Catholic Cathedral. 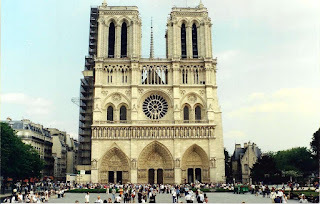 Notre Dame is widely considered one of the finest examples of French Gothic architecture in the world. Construction began in 1163, during the reign of Louis VII. The cathedral was effectively complete by around 1345. The cathedral suffered desecration during the radical phase of the French Revolution in the 1790s, when much of its religious imagery was damaged or destroyed. During the 19th century, an extensive restoration project was completed, returning the cathedral to its previous state. 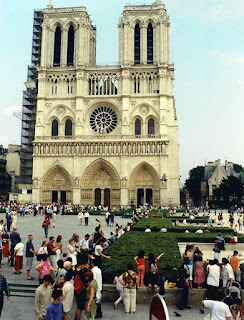 The Notre Dame de Paris stands on the site of Paris' first Christian church, Saint Etienne basilica, which was itself built on the site of a Roman temple to Jupiter. 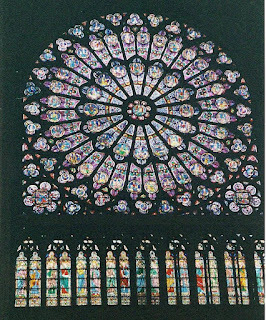 The north rose window dates from 1250. Its main theme is the Old Testament, but the central medallion depicts the Virgin and Child.A Rose window (or Catherine window) is often used as a generic term applied to a circular window, but is especially used for those found in churches of the Gothic architectural style. 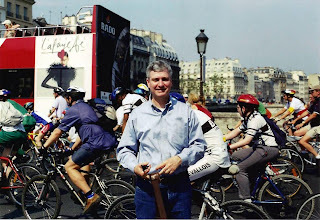 Some streets in Paris are closed on Sundays for cyclists and pedestrians.These operations are called "Paris respire" (Paris breathes). 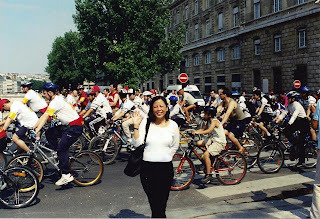 When we were in front of Notre Dame, the streets were closed and hundreds of cyclists rode by. Street scene in Paris near the Notre Dame. 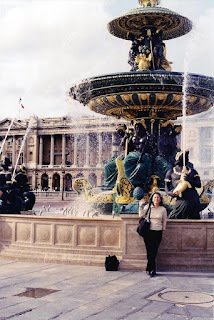 Catherine at the Place de la Concorde. You can see Hittorf's fountain (1838) behind her. 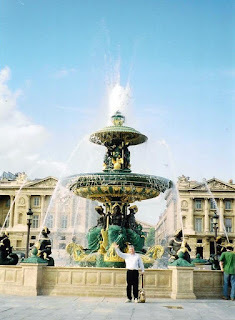 The Place de la Concorde is one of the major public squares in Paris, France. In the past, when it was named the "Place de Grève", it was a site where the nobility were entertained watching convicted criminals being dismembered alive. During the French Revolution the statue of Louis XV was torn down and the area renamed "Place de la Révolution". The new revolutionary government erected the guillotine there. King Louis XVI was executed here on January 21, 1793 and Queen Marie Antoinette on October 16, 1793. The guillotine was most active during the "Reign of Terror", in the summer of 1794, when in a single month more than 1,400 people were executed. A year later, when the revolution was taking a more moderate course, the guillotine was removed from the square and its name was changed in token of national reconciliation. 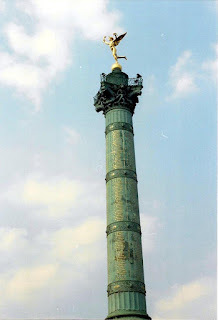 The July Column (French: Colonne de Juillet) is a monument to the Revolution of 1830. It stands in the center of the Place de la Bastille, in Paris, to commemorate the Trois Glorieuses, the "three glorious" days in July 1830 that saw the fall of Charles X of France and the commencement of the "July Monarchy" of Louis-Philippe. On the column stands a gilded figure, Auguste Dumont's Génie de la Liberté (the "Spirit of Freedom"). Perched on one foot in the manner of Giambologna's Mercury, the star-crowned figure holds the torch of civilisation and the remains of his broken chains. Formerly the figure also appeared on French ten-franc coins. The column is also engraved in gold with the names of Parisians who died during the revolution. No we didn't eat there, but we drove by on the way to the Notre Dame. It is located on the rue Royale and is known for its art nouveau interior decor. Chefs that worked at Maxim's included a young Wolfgang Puck. 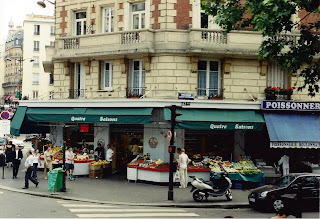 Maxim's was founded as a bistro in 1893 by Maxime Gaillard a former a waiter. Today, the restaurant and the Maxim's brand belong to Pierre Cardin. 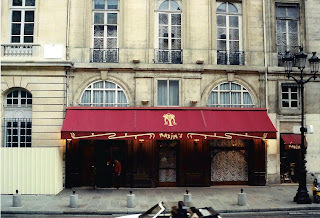 Maxim's was also featured in one of my favorite movies, Gigi featuring French actors Maurice Chevalier and Leslie Caron.